Remember when "summer food" meant a picnic and maybe a trip to the local creemee stand? Such was the case when the Seven Days "Snack Attack" series debuted in 2007, surveying the state's seasonal snack bars. But, while those outdoor eateries will always appeal, there's a new trend on the rise: the food truck. This summer, warm-weather diners can expect to see that form of meals on wheels out in full — and fried — force, with options ranging from vegan sweets to barbecue. In honor of the gluttonous national trend that Vermont has finally embraced, this year Seven Days staffers sampled exclusively mobile eateries for our summer food trek. The South End Truck Stop at Burlington's ArtsRiot made trying out several new trucks as easy as shooting fish sticks in a basket. Debuts at the Friday evening event's May 16 opening included a dessert specialist, Asian street food and new Latin American eats from an old favorite. Other writers ventured outside the Queen City for competition-style 'cue, ramp-adorned flatbread and something called a Chicken Bomb. Without question, tracking the food-truck explosion is one of our new favorite ways to spend the summer. And if we stuff ourselves to the point of discomfort to taste the best from every vendor we encounter, all we can say is, "Kaboom!" 371-9344. Ryder Brook Golf Club, 3266 Laporte Road, Morrisville. Wednesday through Saturday, 11 a.m. to 8 p.m.; Sunday, 8 a.m. to 2 p.m. Looking for a meal rife with ramps? You could head to a locavore, fine-dining establishment, or you could hit the Ryder Brook Golf Club in Morrisville. There, Sandi Schlosser serves seasonal fare — including a recent rash of spring onions picked nearby — out of her food truck five days a week. That devotion to prime ingredients is only natural for Schlosser, a 2009 New England Culinary Institute grad. She grew up on Sandiwood Farm in Wolcott, where she still cooks farm-to-fork dinners several times each summer. But when Schlosser's Vermont Harvest Catering isn't crafting high-end eats for a party in Stowe, the chef is likely to be parked outside the clubhouse of the golf course owned by her boyfriend, Johann Jaremczuk. Schlosser and Jaremczuk began looking for a food truck last year. "Everything we looked at was kind of rundown and dirty," recalls Schlosser, who eventually decided to have the truck custom built. The resulting mobile kitchen is exceptionally well stocked, with cold prep, range top, oven, grill and fryer all in a row. Schlosser needs that array for the breadth of the menu she serves each day to passersby on Route 100. 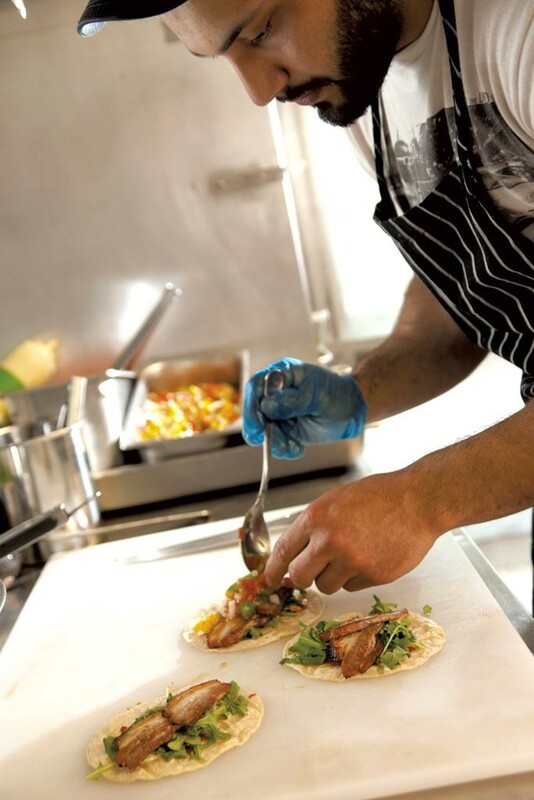 From the grill, the chef proffers a different flatbread daily. On a recent Friday, fresh mozzarella holds in place sautéed mushrooms, olives and ramps between puffy edges of dough. The pungent allium also appears mixed with mac and cheese that's rolled into petite, panko-crusted balls and fried. The bracing freshness of the ramps keeps the fried-cheese-carb balls from reaching overkill. Big flavors are key to the success of Schlosser's overstuffed tacos. A slow burn builds with each bite of the crisp-edged chicken marinated in ginger and chiles. A wash of lime crema and homemade corn-and-tomato salsa moderate the heat. A relatively virtuous lunch of the veggie-heavy tacos leaves guests with an excuse to binge on Schlosser's airy doughnuts, covered in powdered sugar. They're served in a brown paper bag, like so many guilty pleasures. But when dessert is that well made, remorse is beside the point. Radio Bean and ¡Duino! (Duende) proprietor Lee Anderson found his food cart's namesake dish years ago on the smoky streets of Puerto Rico. A friend was building houses down there, making the island a natural destination. "It was just really easy to go there — go swimming in the Bio Bay with all the phytoplankton, and gorge yourself on barbecue all day," Anderson recalls. He fell particularly hard for humble marinated meats-on-a-stick called pinchos. Last summer, he started serving them (and a vegan version) from a mobile cart around town. 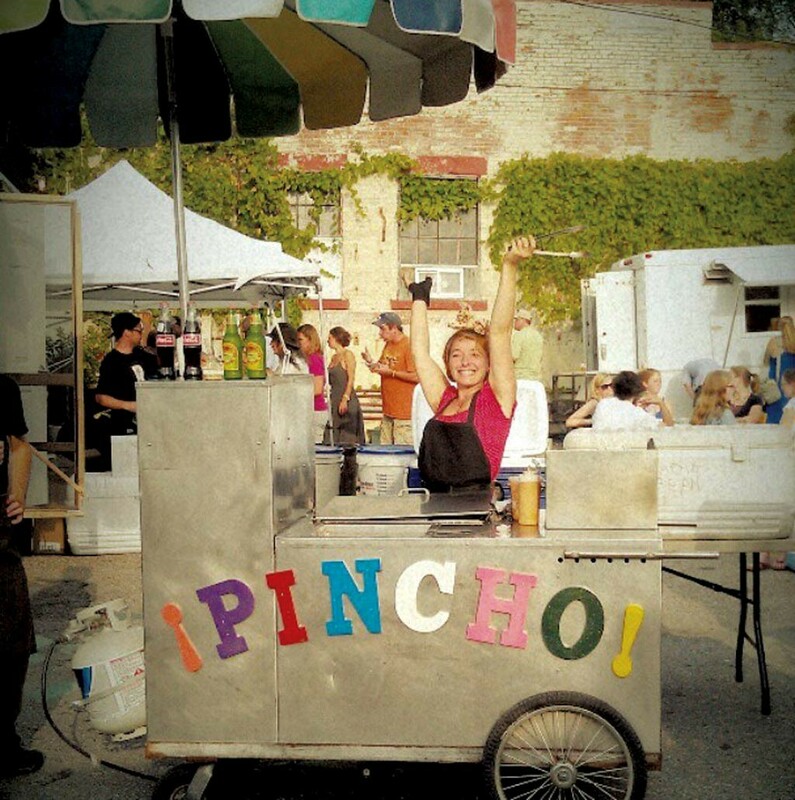 The Pincho cart is back this summer with new dishes and a few reruns. Carnivores can choose from a variety of local, organic meats, which are skewered, grilled and served with coconut rice, beans, picadillo (a tangy chopped-cabbage salad) and spicy pincho sauce. Meat shunners can snack on garlicky grilled summer squash with the same accoutrements. Vegetarians and vegans can try a similar dish with lentils and potatoes instead of chicken; or sample elote, that Latin American grilled corn on the cob (served to nonvegans with crumbled cheese and housemade chipotle aioli). In the weeks to come, look for more tamales at Pincho, stuffed with pork and kimchi and other choices. All of them, Anderson would like you to know, are as organic as possible. "We can't say we're 100 percent yet," he acknowledges, but notes that, in addition to serving organic meats and produce, he keeps the staples — masa, flour, spices and sauces — free of synthetic chemicals and GMOs. South End Truck Stop at ArtsRiot, 400 Pine Street, Burlington, Fridays through fall, 5 to 10 p.m. Many of the delectable options available last Friday at ArtsRiot's summer food truck stop were savory — and spicy — affairs. Not at the Dessert for Breakfast booth, parked strategically near the exit, which makes raw, vegan, gluten-free and dairy-free cakes, ice cream and candy. Owner Sarah DeFranco, 26, prepares them using a few key ingredients: coconut oil, dates, cacao, bananas and walnuts crop up in just about every menu offering. "This stuff is healthier than what most people eat for breakfast," she says. Her Key lime "cheese" cake is cool, frothy and sweet. The coconut-oil-based filling melts in your mouth, with a delightfully tart aftertaste, while the walnut-and-date crust adds richness and a hint of salt and crunch. DeFranco's mango sorbet is made with mango, "a tiny bit of lemon, maple syrup and ice," she says, letting the fruit do all the work. Similarly, she keeps the chocolate-covered bananas simple: The dessert is essentially a frozen banana. Though DeFranco's raw cacao-based coating is rich and perfectly sweetened, the treat begs for an extra something to set it apart. The ice cream sandwich is a big cube of banana "ice cream" with a cacao, walnut and date "brownie" covered in chocolate. Though the brownie itself is a lovely combination of mellow sweetness, chocolaty cacao and crunch from the walnuts, the flavor of the big block of frozen banana overwhelms it. DeFranco says future sandwiches will feature less dense ice cream from her new ice cream maker. The coconut-caramel clusters are the crème of the crop: A cookie-like layer of coconut and vanilla is topped with creamy "caramel" made from dates, then with shredded coconut. The caramel and vanilla flavors add extra dimension to the same chocolate covering that's less dynamic on other menu options. All in all, DeFranco works magic with limited starting ingredients. As her menu grows and diversifies, it's a sure bet that she'll deliver more meal-worthy desserts. 343-1401. 27 Susie Wilson Road, Essex Junction. Tuesday through Friday, 11 a.m. to 3:30 p.m. Proprietor Rich Decker has earned his street cred among local barbecue aficionados: In his first-ever competitive season, he won Harpoon's 2003 New England Regional BBQ Championship — and the grilling competition the next day. Since then, he's twice taken home the grand prize at Pennsylvania's statewide BBQ cook-off, and won New Jersey's equivalent three times. Not bad for a retired carpenter and Philadelphia native who grew up eating cheesesteaks. The mixed grill at Lost Nation (named for the Essex road where Decker lives) includes two fat, dry-rubbed ribs, a pulled-pork sandwich, baked beans and coleslaw ($12). The last item is tangy, well seasoned and crunchy fresh. The ribs are thick, meaty and flavorful, without too much fat. Though Decker describes his meats as "Kansas City style," he offers three different sauces, all served on the side: a vinegar-based Carolina sauce, a sweet-and-savory KC sauce, and a hotter version of the latter. Also good were the baked beans, which Decker flavors with grilled onions and spicy sausage. No secrets there. Decker publishes all his recipes on his website, reasoning that, he says, "Sometimes I can't cook the same thing twice, so chances are you can't, either." The only issue one might have with the meal involves the meager bun on which the ample pulled-pork sandwich is served. Such greasy, porky goodness deserves a heartier bun as its delivery device. Decker earns bonus points for his charitable work. He's a member of Operation BBQ Relief, a national nonprofit that shows up after major disasters to hand out free meals. After Hurricane Sandy leveled the Jersey Shore in 2012, Decker joined the many vendors who collectively served 121,000 meals. He also donates all his tips to the Ronald McDonald House. Smokin' good deeds! 324-6220. 400 Pine Street, Burlington, Monday through Friday, 11 a.m. to 3 p.m.; also serving at that address Fridays through fall, 5 to 10 p.m., as part of the South End Truck Stop at ArtsRiot. 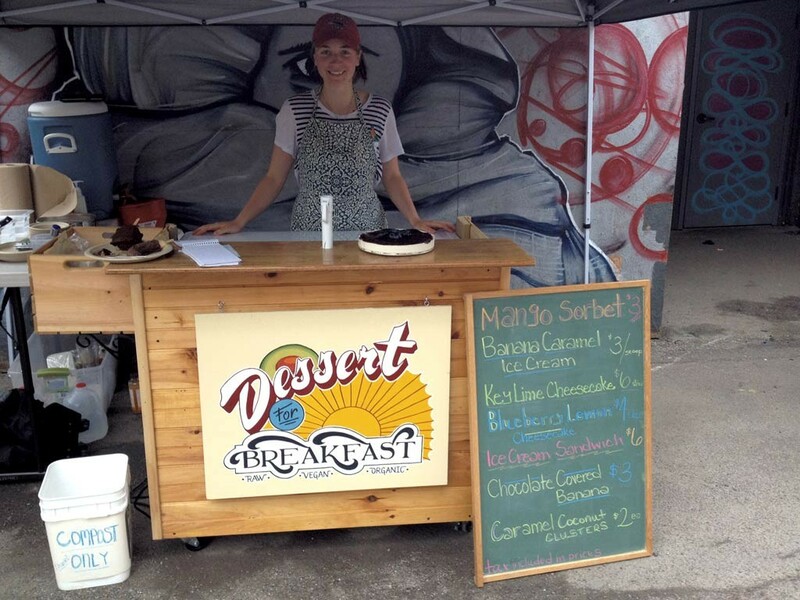 Inasmuch as Dolce VT's food might be described as a riot of flavors, the food truck has found a suitable location to park its bad self: outside ArtsRiot on Burlington's Pine Street. 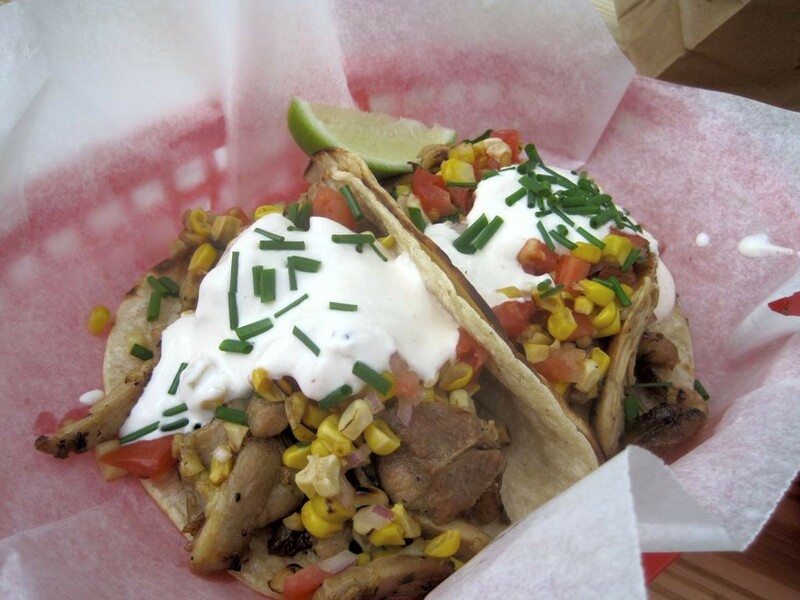 The "riot" in the tacos comes courtesy of well-seasoned pork (cumin, pepper, maybe star anise?) surrounded by avocado, pickled carrots and onions, cilantro, and three condiments: Sriracha, hoisin sauce and basil aioli. Stefano Cicirello, 24, the owner-chef of Dolce VT, says, "I grew up in a really traditional Italian family. A lot of my inspiration is food that I did eat all the time — but also food that I didn't get to eat." Those tacos reflect Cicirello's impulse not to hew too closely to any one cuisine; eating them is sort of like sampling the foods of several continents at once. The taco would be fine without the aioli, as the basil got lost, anyway. But the hoisin sauce is a great touch. The soft, mercifully unseasoned flour tortillas somehow withstand the onslaught of culinary lubricants. Diners can add another taste of Europe to their midday meal by ordering the truffle fries. Thin and hot from the fryer, these are top-notch frites, nicely salted and gaining a musty punch from a drizzle of truffle oil. Cicirello, who trained as a pastry chef, admits that the name of his truck is somewhat misleading: Dolce means "sweet," but there are currently no desserts on the menu. "This is a working man's street," he explains. "There are so many businesses, and it's really blue collar. People want lunch. They don't want a doughnut or a croissant." Cicirello is waiting to develop a more regular clientele before introducing pastries, which are expensive and have short shelf lives, a particular problem for mobile restaurants. He also hopes to start offering breakfast to morning commuters, he says. Dolce VT has a sweet deal with ArtsRiot: To pay for the electricity he taps, Cicirello makes lunch for the café and gallery's staff. ArtsRiot's newly constructed sidewalk beer garden gives Dolce VT the valuable advantage of a seating area. It's a great place to people watch on a sunny day. 279-6427. Spooner Specialties, 120 River Street, Montpelier, Tuesday, 4 to 7 p.m., and Thursday, 11 a.m. to 2 p.m.; Tractor Supply Company, 352 River Street, Montpelier, Wednesday, 11 a.m. to 2 p.m.; Capitol City Auto Mart, 1162 U.S. Route 2, Montpelier, Friday, 11 a.m. to 2 p.m.; Plainfield Farmers Market, Friday, 4 to 7 p.m.
Shawn "Mo" Moshinskie is a popular guy. On a recent Thursday, horns sound every few minutes as friends and fans spy the burly cook parked in front of Spooner Specialties in Montpelier. While Moshinskie says he enjoys meeting new people, the honks may not be so much for his social skills as for his culinary chops. 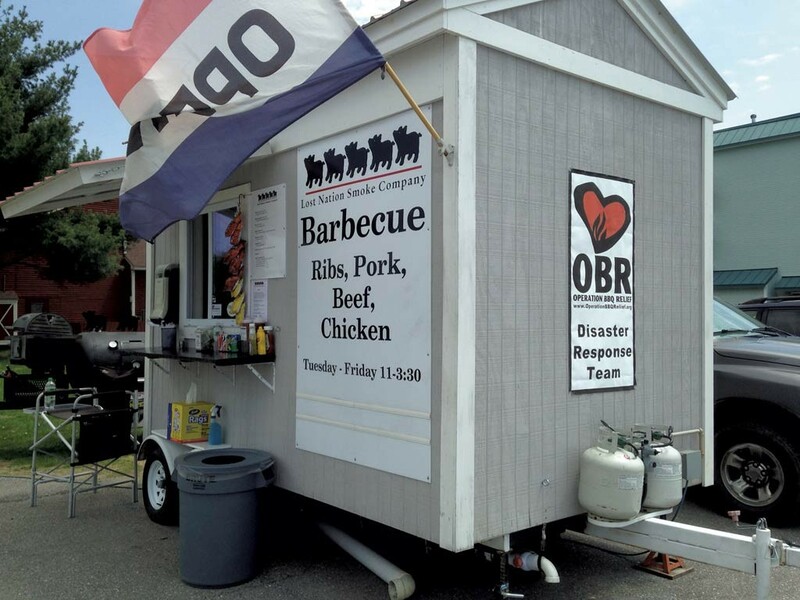 Since May 2013, he's parked his barbecue setup all over the Montpelier area as Mo's Backyard BBQ. Though he wears a black chef's jacket with a toque-sporting pig logo (in which the image of a pork rib replaces the apostrophe in "Mo's"), Moshinskie admits he had no professional culinary experience before he headed south to buy his mobile grill and smoker. "I was pretty much sick of people telling me what to do at work," recalls the former construction worker and landscaper. "It was the wife's idea: 'Let's just buy it.'" That was good thinking from Amanda Moran Moshinskie. Shawn also credits his wife with his signature item, the Chicken Bomb. It's a suitably weighty name for the chicken roulade stuffed with garlic and a blend of cheeses, then wrapped in bacon and slowly smoked. If that doesn't lay waste to diners' hunger, Moshinskie's mac and cheese will. The pile of elbow noodles is coated in Gouda, cheddar and Parmesan and mixed with cream cheese for an exceptionally smooth mac. Moshinskie smokes it just enough to evoke campfire dining, not a California wildfire. 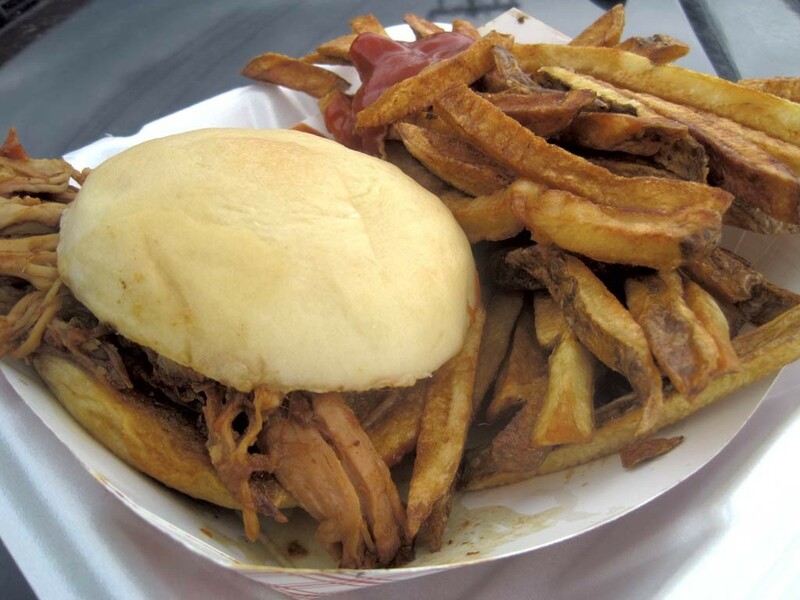 A light wisp of smoke also imbues Moshinskie's pulled pork. He serves the hearty, if underseasoned, chunks of pig on an equally sturdy bun from Red Door Bakery in his hometown of Marshfield. Exceptionally crisp, handcut fries come on the side. Unlike Rich Decker of Lost Nation Smoke, Moshinskie has yet to turn his love of outdoor cookery into a competitive career. For that, he'll need to switch from using his gas pit to wood — a leap he hopes to make by next season, when he'll also enter Harpoon's New England Regional BBQ Championship. As long as he keeps smoking that pasta, we'll be cheering him on. 324-5071. South End Truck Stop at ArtsRiot, 400 Pine Street, Burlington, Fridays through fall, 5 to 10 p.m.; also in residence on Wednesday nights at ArtsRiot Kitchen Collective. A few years ago, Jeremy Bernozzi found himself marooned in Malaysia with no plans and little money. "My girlfriend lost her passport at the airport, and we got stuck in Kuala Lumpur," says the cook, who worked at Brattleboro's long-running vegetarian counterculture café the Common Ground in the early aughts. "We had nothing to do but wait," Bernozzi goes on, "but there [were] street vendors everywhere. Then I realized it was some of the best food in the whole world ... I completely fell in love with the place." At the time, Bernozzi was teaching English in China. He returned to Malaysia later that year and again in 2013, and now he's itching to go back. "I haven't even scratched the surface of the food there," he says. 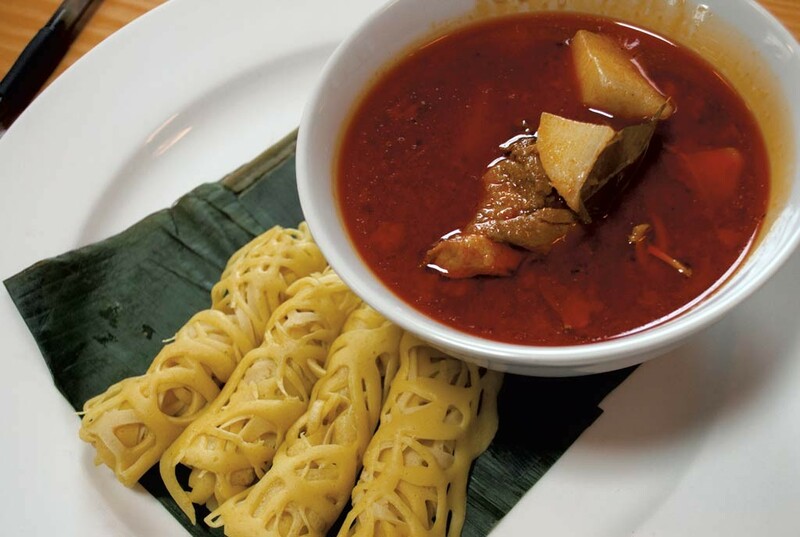 But the internet provides: Turns out, Malaysians are fanatical food bloggers. "They're amazingly prolific, and they often write in English," Bernozzi says. "So it's really easy to learn how to make things." With share-happy Malaysians and remembered tastes to guide him, Bernozzi set out to recreate dishes from Kuala Lumpur and beyond. He's spent the past five years combing through centuries of Asian culinary history for recipes. The result is the Hawker Stall, which Bernozzi opened last winter with weekly dinners at ArtsRiot Kitchen Collective. This summer, hit him up at the South End Truck Stop for fragrant Malay curries and spicy pickled vegetables served over coconut-scented jasmine rice. You'll also find Bernozzi splashing lacy crêpes onto the griddle in intricate filigrees, which he rolls into petite rôtis once they firm up. These savory, tumeric-tinged flatcakes are tasty alone, but make a stellar vehicle for Bernozzi's rotating cast of curries. Right now, look for chicken and potato Nonya stew, heavy with warm spice (anise, clove, cinnamon) and sweetened and tempered with coconut milk and a spicy slick of chili oil. Deep-dip your rôti for a satisfying snack and wash it down with a crisp, cold brew. The original print version of this article was headlined "Snack Attack 2014"